"Most people who replace their ground beef with buffalo, in recipes like meatballs, burgers, and meatloaf, are usually disappointed. Ground buffalo is much leaner than ground beef, which is the biggest challenge. In case you're new, it's the fat that provides most of the flavor and moisture. Also, for whatever reason, pre-packaged buffalo is ground very fine, almost to a paste, which can lead to a rubbery meatloaf, unless you use a few tricks." Melt butter in a large skillet over medium-heat. Cook and stir chopped bacon in hot butter until almost crisp, 5 to 10 minutes. Pulse onion, carrot, celery, red bell pepper, poblano pepper, mushrooms, and garlic in a food processor until finely chopped. Add vegetable mixture and rosemary to bacon in the skillet; cook and stir until vegetables soften and sweeten, about 5 minutes. Mix vegetable mixture, bread crumbs, and milk together in a bowl. Let cool to room temperature. Stir egg, salt, Worcestershire sauce, black pepper, and cayenne pepper into vegetable mixture. Add buffalo meat to vegetable mixture and mix with your hands until well-blended. Turn meat mixture out into prepared baking dish and shape into a 9x5x3-inch meatloaf. 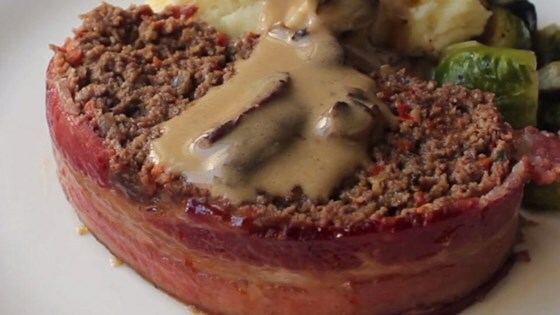 Lay bacon strips crosswise over the top of the meatloaf, tucking in ends of bacon under the loaf. Whisk rice vinegar, brown sugar, and mustard together in a bowl until glaze is smooth. Bake meatloaf in the preheated oven for 30 minutes. Brush glaze over loaf and continue baking until no longer pink in the center, about 30 minutes more. An instant-read thermometer inserted into the center should read at least 155 degrees F (68 degrees C). Cool for 10 minutes before slicing. You can substitute 2 teaspoons chopped fresh rosemary for the 1/4 teaspoon dried rosemary, if desired. To check for seasoning: once everything is mixed, fry a small piece of the meatloaf mixture and taste. Adjust, if necessary, and recheck. My hubby and son said this was good but alittle spicy! I made this with beef instead of bison. I omitted butter. It seemed like an overkill. I subbed zucchini for mushrooms. I used less bacon on top, as I felt like 7 slices was also an overkill. Family loved it.